If you only have 24 hours in Philadelphia, here are the five things you just have to do. 2. Head over to the Philadelphia Museum of Art and pay Sylvester Stallone $40 to tell you what Rocky would have thought about childhood vaccinations: Huddling under the iconic Rocky statue at all hours, day and night, you’ll find a gaunt, emaciated Sylvester Stallone. If you pay Philadelphia’s adopted son two crisp $20 bills, he’ll tell you what Rocky’s opinions on child vaccinations are, even though Stallone himself vehemently disagrees with Rocky on the issue. Only in Philly! 3. Whenever you get hungry, you need to head to Old City to try the actual leather the Founding Fathers ate: Everywhere you look, there are food trucks that cook worn-out leather exactly how the Founding Fathers did it: by using an exact replica of one of Benjamin Franklin’s most-used inventions, which was essentially an early, dangerous toaster that gave everyone tetanus. The crafters of our Constitution ate these melted leather treats for every meal, and now you can see what all the hubbub was about for yourself. 4. Head down to Austin, TX for some mind-blowing Tex-Mex: Philadelphians agree: If you have some time in Philly, you just have to make the 25-hour drive down to Austin, TX for amazing chimichangas or chili con carne that will make you a diehard Philadelphia fan for life. 5. 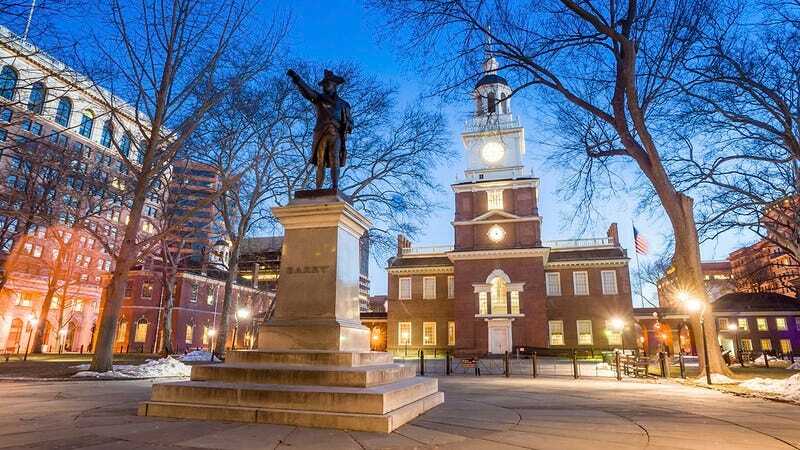 Swing by the Independence Hall, which is rumored to have Thomas Jefferson’s entire skeleton attached to the bathroom key: If you’re looking for some real local history, you should definitely stop by Independence Hall for a tour, and while you’re there, be sure to ask to use the bathroom. While no one is completely sure of the exact identity of the 6-foot, 2-inch skeleton attached to the bathroom key, it did appear the day after someone stole Jefferson’s skeleton from Monticello, and the head custodian is known to say, “That fucker there? That’s Thomas Julius Jefferson, my friend,” if you ask him about it. So cool.